"I didn't ever think it would happen but it did as we spent night after night in swamps infested with bugs, snakes, piranhas etc. Sitting in the pitch black, after midnight, blowing into a gourd to imitate the growl of the Jaguar. One of the only three cats that roars and has the biggest canines of any Feline, as it crushes the skull of it's prey. I was on a muddy bar completely exposed listening to the night sounds. Then I heard it, the heavy breathing, the the padded footsteps as it neared. How far I didn't know but it was very close. My native guide switched on the flashlight and there he was in the regal rosettes, less than four yards and looking right at me! No time to think as the Schafer bow powered the arrow into the center of his chest below the neck as he was facing me. 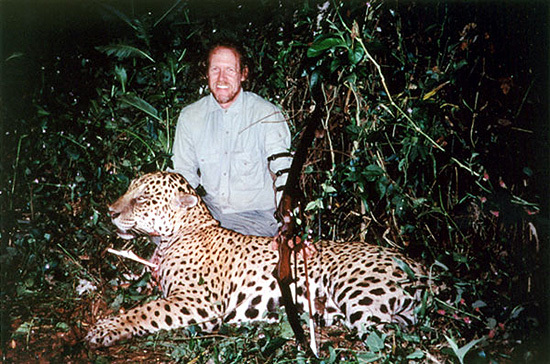 A loud roar and vertical jump composed of spots is all I remember until I found him a few minutes later just 36 yards away in the thickest jungle you can imagine. All 286 pounds of the most beautiful creature I have ever seen. Without a doubt the pinnacle of my bowhunting career has been with my Schafer bow for the past eight out of 15 years." "One word best describes my Schafer Silvertips, "Shootablility" They are just a joy to shoot. Smooth, stable and quick. Dave definitely puts the word "custom" in custom bows. They are truly a work of art. That's why I've shot them exclusively for over 15 years. Currently I own 7 Silvertips." "Silvertips are the smoothest, fastest bows on the market. It is the only bow I hunt with because it instills confidence." I picked up my bow from the post office this morning. I've been shooting this piece of art ever since. Very nice, and I'm extremely happy with my purchase. I've tuned the bow and the first round of arrows through the new bow from 15 yrds was a nice tight 5" group (see pic). The second round was at 20 yrds. And again, nice tight group. I really thought I'd have to shoot every day until bow season....well I was wrong. All i have to do is point and release. They go right where i want them to go. Dave you are an exceptional bow craftsman. Im an artist with steel and the attention to detail is my daily routine, so I know great work when i see it. Not only is your bow beautiful, it functions superbly. The weight of the bow is nice and balanced. The draw is smooth, the bow is quiet, and super fast and flat shooting. This will be an heirloom for the Hartness family of bow hunters for many generations. I'm sure my great great grand son will get the same pleasure from shooting this bow as i am this morning. Thank you for your hard work. Beth, thank you for your help and communication through this purchase.